A Walton-Beckett graticule is an eyepiece graticule specifically designed for asbestos fiber counting. 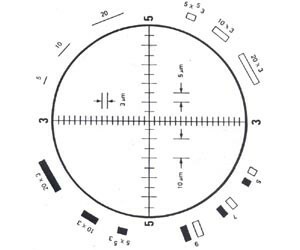 It consists of a circle with a projected diameter of 100 plus or minus 2 µm (area of about 0.00785 mm2) with a crosshair having tic-marks at 3-µm intervals in one direction and 5-µm in the orthogonal direction. There are marks around the periphery of the circle to demonstrate the proper sizes and shapes of fibers. This design is reproduced in the above image. The disk is placed in one of the microscope eyepieces so that the design is superimposed on the field of view. For use with the Olympus CX31 Microscope.